It is our goal to provide our clients with exceptional food and incomparable catering services. Our reputation and growth have come from a result of our attention to detail, quality gourmet food, and friendly professional service. As a full service special event caterer and wedding caterer, we will do what it is necessary to ensure our clients' expectations are not only met, but exceeded. Let us show you why we are "A STEP ABOVE THE REST!" 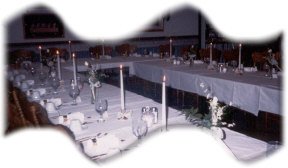 Whether you're needs are for a wedding reception caterer, Holiday Party, BBQ catering, special event, backyard/home wedding reception, backyard party, funeral, birthday party, or childrens birthday party in Webster County our event catering services make entertaining easy. Our experienced consultants and trained culinary team will assist you in planning and executing your special event. From intimate to grand, lavish to informal, we can create the perfect menu, décor, and ambiance your guests will remember. If you do not find what you are looking for we will customize a menu for you. We will assist you every step of the way! This is what catering is all about!